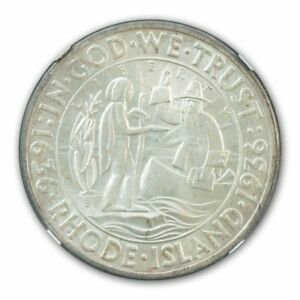 Though America's smallest state, Rhode Island nevertheless managed to obtain a commemorative coin of its own in 1936. 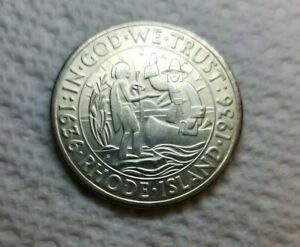 This type marked the 300th anniversary of the founding of Providence, now the state's capital, yet no mention of this city may be found on the coin! 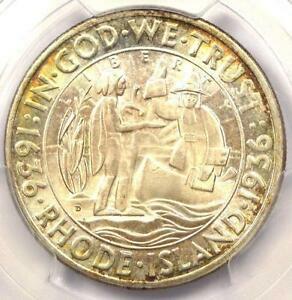 The prime mover behind the founding of Providence was Roger Williams (c. 1603-1683). A Puritan, he followed in the footsteps of his predecessors by relocating from England to Massachusetts in 1631. Two years later, he found himself minister of the church in Salem, yet his unconventional beliefs shortly led him into conflict with the Massachusetts General Court. Though the Puritans were themselves refugees from religious intolerance, Williams' promotion of religious freedom and the separation of church and state threatened their homogeneous society. He also dared to suggest that the native people should be paid for their land. Banished in 1635, Williams purchased a parcel of land from the Narragansett Indians the following year and established his own settlement. Calling it Providence (a tribute to God's goodwill), his policy of religious freedom soon drew those of like mind, and additional nearby communities appeared. Flushed with this success, Williams returned to England in 1643 seeking recognition for the colony. Though it was then in the midst of a protracted civil war, Parliament granted him a patent uniting the Providence Plantations and Rhode Island into a single colony. Despite having his patent revoked on one occasion, Roger Williams ultimately managed to obtain a royal charter from King Charles II in 1663. 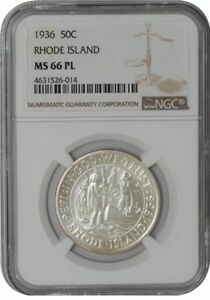 The Rhode Island and Providence Plantations Tercentenary Committee was created in 1931 to honor the 300th anniversary of the landing of Roger Williams in 1636 and his founding of Providence. Its Chairman was Judge Ira Lloyd Letts. Seeking a means of funding the celebrations planned for 1936, the Committee petitioned Congress for a commemorative coin. 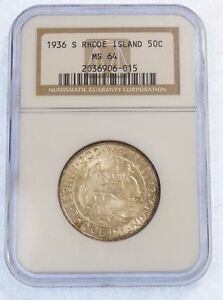 In a bill which included the Hudson, New York coin as well, the Rhode Island half dollar was approved May 2, 1935. A total of 50,000 coins was authorized, and the Committee requested that these be struck at all three mints. Selected to prepare the designs to the Committee's specifications were John Howard Benson, an instructor at the Rhode Island School of Design, and silversmith Arthur Graham Carey. Both had been recommended to the Committee by the school's Director, a Mr. Farnum. 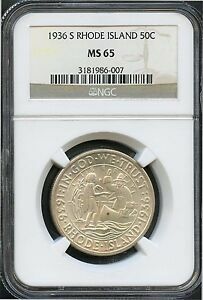 It was the artists' goal to create a coin which "would give, when ‘oxidized,' a good black and white pattern." Toward this end, they sculpted their design in the style of centuries-old gravestones found in New England. 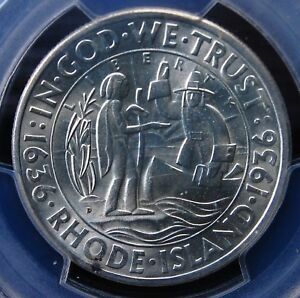 The original models included, in addition to the features ultimately retained, the Seven Stars of an early Providence City seal, a quotation from Roger Williams and a legend identifying the exact events being commemorated. When their models were submitted to the Committee, it was learned by Benson and Carey that the clamoring by other artists to be considered in the process had prompted Judge Letts to call for a competition. Despite this setback, the models created by Benson and Carey were indeed selected as the winners on November 6, 1935, though additional changes were mandated. When their models were submitted to the Federal Commission of Fine Arts, they were reviewed by its sculptor member, Lee Lawrie. 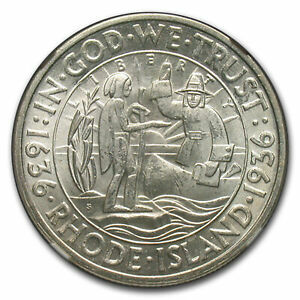 Though Lawrie actually preferred the model featuring the Seven Stars, it was his understanding that the Rhode Island Committee favored the one which depicted Roger Williams coming ashore and being greeted by a friendly native. The reverse design selected was dominated by the state seal. With some reservations, Lawrie recommended approval of the chosen models, and the Commission followed through on his recommendation at its meeting of December 20, 1935. 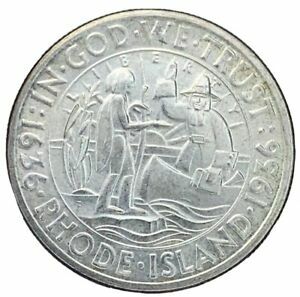 As with many commemorative coins, the hub reductions for the Rhode Island issue were contracted out to Medallic Art Company of New York City. The Philadelphia Mint struck 20,013 coins in January, and this was followed in the next month by 15,010 at the Denver Mint and 15,011 at San Francisco (the few extra pieces included in these figures were reserved for the Assay Commission and later destroyed). 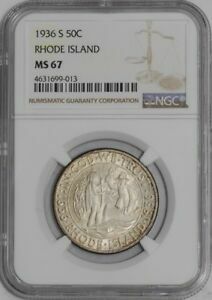 Official distribution of the Rhode Island Tercentenary Half Dollar (the finished coins bore no reference to Providence) was set for March 5, 1936. 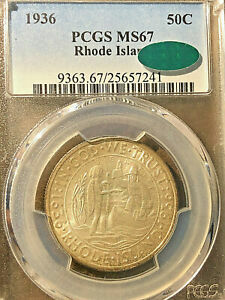 Handling this distribution were the Rhode Island Hospital National Bank and prominent coin dealer Horace M. Grant, both operating out of Providence. Various local banks around the state of Rhode Island also received small allotments. 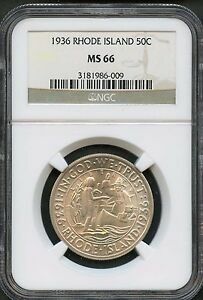 Grant's role was to provide these coins to interested collectors nationwide, and he received nearly 7,000 pieces. The official issue price was $1 per coin, or $1.50 when purchased by mail. 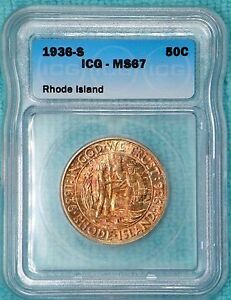 Collectors ordering one or more pieces, however, were dismayed to learn that the entire mintage had been sold out the same day it was offered - at least that's what they were told. A publicity campaign was launched to herald this sellout, which was attributed to demand from Rhode Island residents, and it quoted Committee Treasurer Arthur L. Philbrick as reporting a complete distribution of the halves within six hours. 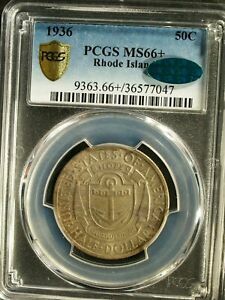 But when it was discovered that there were plenty of coin dealers who had these halves for sale at inflated prices, hobby leaders smelled a rat. Though no one was ever prosecuted, both the Committee and dealer Grant were cast in a very unfavorable light. One of the most prominent protestors was dealer and coin promoter L. W. Hoffecker of Texas, himself no stranger to the manipulating of commemorative sales. On February 23, 1938, the Rhode Island and Providence Plantations Tercentenary Committee was disbanded, leaving a profit of $24,000. Two-thirds of this money was directed toward the cost of erecting a statue of Roger Williams. It was not specified what became of the rest of the money, as the Committee showed an ending balance of just $322. 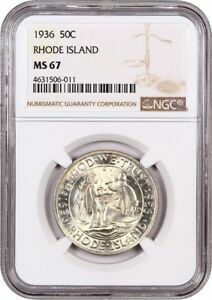 Rhode Island Half Dollars are fairly abundant in the lower grades of Mint State. It is only in grades MS-64 and higher that they become somewhat scarce. 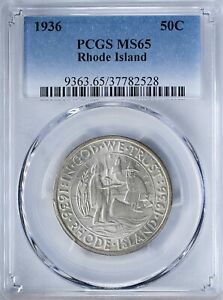 The key issue in higher grades is 1936-S, while the Philadelphia Mint strikings are the most readily available. The luster of these coins ranges from frosty (whether dull or brilliant) to semi-prooflike or even fully prooflike; the latter are quite rare. 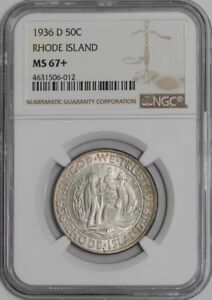 A number of Rhode Island halves may be found lightly worn, and these are probably coins that were sold to the general public and mishandled. The first points to check for wear are the Indian's right shoulder and the center of the anchor. On June 24, 1936, the Rhode Island Committee announced that the first 100 specimens struck at each mint had been placed into separate, numbered envelopes. 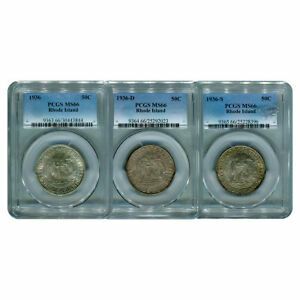 These would be sold in three-coin sets to the highest bidders, the deadline for the receipt of bids being July 13. 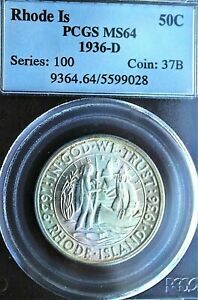 Whether these coins actually were reserved and later sold as stated is uncertain, as no such sets have turned up in the marketplace, nor are there any confirmed proofs. 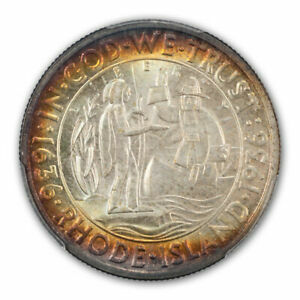 Most Rhode Island halves were sold either unholdered (for walk-in orders) or in plain, square white envelopes. Multiple-coin orders were delivered in generic, five-place cardboard holders with no printing. These were inserted into tan envelopes reading RHODE ISLAND HOSPITAL NATIONAL BANK, 15 WESTMINSTER ST., PROVIDENCE, R.I. and imprinted with the bank's logo. Those distributed by dealer Grant were mailed in envelopes marked GRANT'S HOBBY SHOP, HORACE M. GRANT, PROP. 109 EMPIRE ST., PROVIDENCE, R.I.